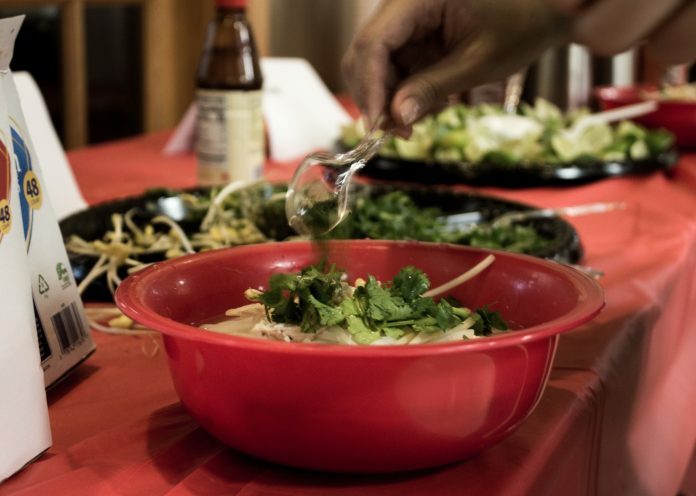 Pi Kappa Phi fraternity hosted the Asian American Student Union annual pho dinner for the first time this year as both a fundraiser and social event for both organizations. Pi Kappa Pho drew over 200 attendees. This event brought together people from diverse reaches of student life to share in fraternity and great Asian food. Asian American Student Union president Jordan Peyton said the idea came serendipitously from a conversation with Martin Ortega, president of Pi Kappa Phi. “I was actually just talking to the [Pi Kappa Phi] president one day, and he said he really liked pho and we just kind of struck up a conversation about how we do this event and then we just kind of settled on a partnership,” Peyton said. Ortega, senior in electrical engineering, said he was encouraged by the record turnout, and he is optimistic about the possibility of future event planning between diverse organizations. 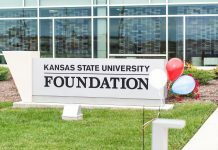 “This event is meant to help expand the horizons of fraternities and make sure everybody is hosting events with one another and that it’s not just the Greek community being so exclusive,” Ortega said. Proceeds from the fundraiser will be shared between the AASU and Pi Kappa Phi’s philanthropy with The Ability Experience, an organization that aims to help promote awareness and support for people with disabilities. Savannah Rattanavong, former AASU President and recent K-State grad, attended the dinner and was impressed to see the growth of the fundraiser. Peyton and Ortega said they are both enthusiastic about the potential of Pi Kappa Pho for both organizations in years to come. “We think this is a very good stepping stone, not just for us and the AASU but for other fraternities also to do events that might be with a lot of the multicultural fraternities or a lot of the organizations that we just typically don’t see doing stuff with fraternities or sororities,” Ortega said. In the meantime, AASU is currently planning more events for this year and will be partnering next month with the Union Program Council to host the movie “Crazy Rich Asians” on Nov. 2 and 3 in the K-State Student Union. My name is Rebecca Vrbas. I’m the assistant culture editor at the Collegian and a junior in journalism and mass communications. My hobbies include obsessing over an ever-expanding pool of musicals and cats (not the musical). I love writing because of the infinite intricacy of language, as well as its power to cultivate a sense of community through sharing experiences.